We know that sitting in front of a computer checking quote after quote can be time consuming. Let us at John Russell Insurance do the dirty work. We will check our extensive range of policies to make sure you get the cover required. 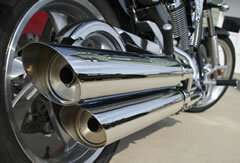 If you have a moped, a customized Harley or anything in between, we have the facility to cover you. Contact our office now for further information, or alternatively click the link below to be directed to our quote and buy page where you will be able to access Ridersure Insurance, one of our partner insurers.